Shy young heiress Lady Lily Rutherford is in no hurry to marry. She dreams of true love and a real courtship. But when disaster strikes, she finds herself facing a scandal-forced marriage to her rescuer, Edward Galbraith, a well-known rake. Despite his reputation Lily is drawn to the handsome Galbraith. In the gamble of her life, she agrees to marry him, hoping to turn a convenient marriage into a love match. As heir to a title, Galbraith knows he must wed, so a convenient marriage suits him perfectly. But there is a darkness in his past, and secrets he refuses to share with his tender-hearted young bride. All Lily's efforts to get close to him fall on stony ground, and in desperation she retreats to his childhood home-the place he's avoided for nearly a decade. Must Lily reconcile herself to a marriage without love? Or will Galbraith realize that this warm-hearted, loving girl is the key to healing the wounds of his past-and his heart? A voice filled with sweetness and it made it fun listening to. The aunt sounds horrible! This book looks good and I love your review. I am glad you enjoyed the narration even if it wasn’t perfect. Lily definitely needed to catch a break from the aunt and the abductor. Glad her rake rescued her. 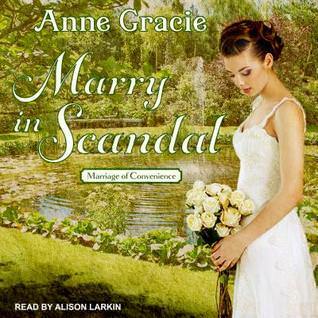 I think I've listened to Alison Larkin narrate a Jane Austen story and remembered that I preferred another narrator for those novels,but she was alright. That whole "not talking" business and the butting of heads because of a misunderstanding or a refusal to communicate drives me nuts, so I'm glad this book was free of that type of drama! The aunt sounds like a witch. Its good to know she would eventually get away from such a life. Happy to know you enjoyed this. I like her books and have this one coming in the post any day soon. I'd try the audio - haven't read her before. HAHA - yes that dress! My blogger, Ang, LOVES Gracie and maybe I should try them on audiobook. Thanks!